Yahoo! has just unveiled upgrades to their search results after Microsoft had done the same late last month for their search engine, Live.com. One of the primary upgrades is Yahoo!’s Search Assist function that tries to anticipate what you want as you type your search query by offering related alternative search phrases in a similar but more comprehensive way than Google’s preceding service, Google Suggest. Search Engine Land provides a good rundown of Yahoo!’s new search features but for our purposes, the one I’m most interested in is that they’ve added blended search results. That means they are including within the search results page links to audio, video and photos as well as web pages. For video, they are actually including an in-line player, so you can watch the video directly on the search results page. 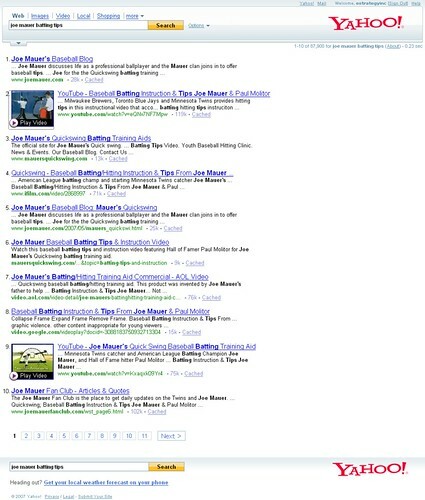 That same search, "joe mauer batting tips," is going to help me demonstrate the importance of not just search engine optimizing your own web sites, but also uploading and optimizing your own content to other online centers of gravity where large audiences congregate and share such as YouTube and Flickr. We uploaded and optimized a 14 minute training video that comes with the Mauer’s Quickswing batting training product at many of the popular video sharing sites such as YouTube, Google Video and iFILM. We also opened a Flickr account and uploaded and optimized photos of the Mauer’s Quickswing. We did this long before Google rolled out their blended search results feature. 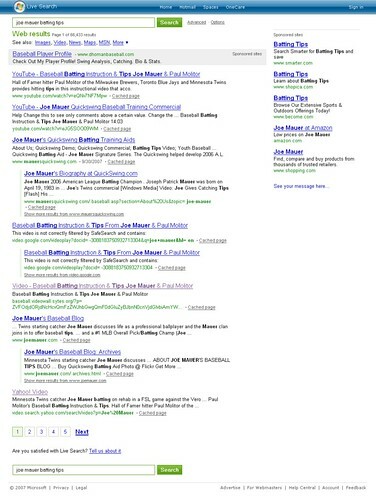 But when they did, the result of that work was that the preponderance of the links on the first page of results for "joe mauer batting tips" lead to content that we provided, either through optimized web sites or optimized content on other sites. The happy end result was that the vast majority of the links went to either the client’s site directly, or to essentially product placements, with either photographic or video demonstrations of the Quickswing product. if you flow this site, you can more benefit from here so i like this site! 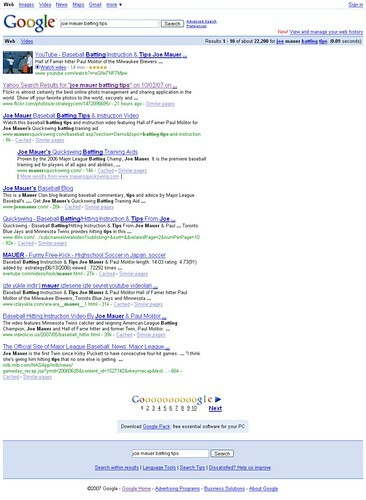 Well, Yahoo has to improve more if they really want to beat Google in search.